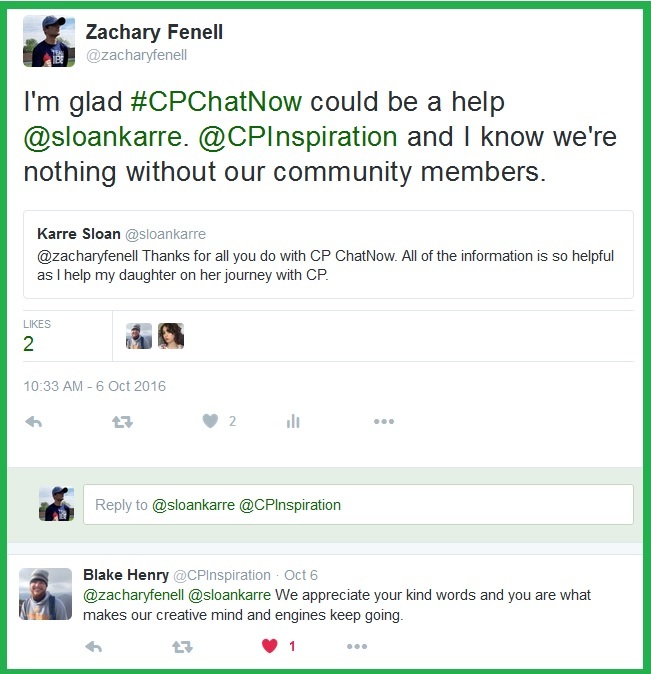 Spirits remained high during #CPChatNow’s live Twitter chat Wednesday, October 5th, coincidentally also World Cerebral Palsy Day. I am co-host Zachary Fenell, prepared to compact all the enthusiasm down into the traditional weekly recap. 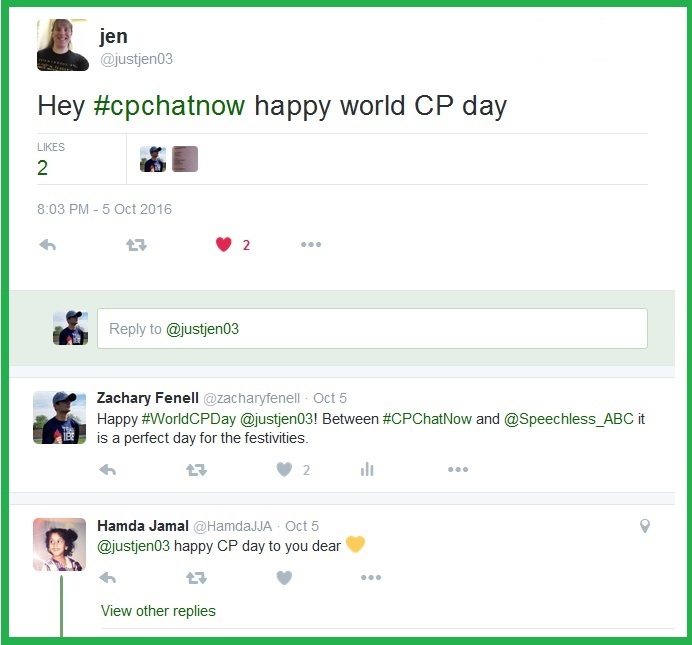 #CPChatNow landing on World Cerebral Palsy Day set up a festive atmosphere. Some participants chose to use our chat to live tweet Speechless. Although, they stayed thoughtful. Considering the show airs at later times in other areas, their dialogue avoided spoilers. Prior to Speechless starting, I sought to stretch the night’s excitement to cover the entire month. 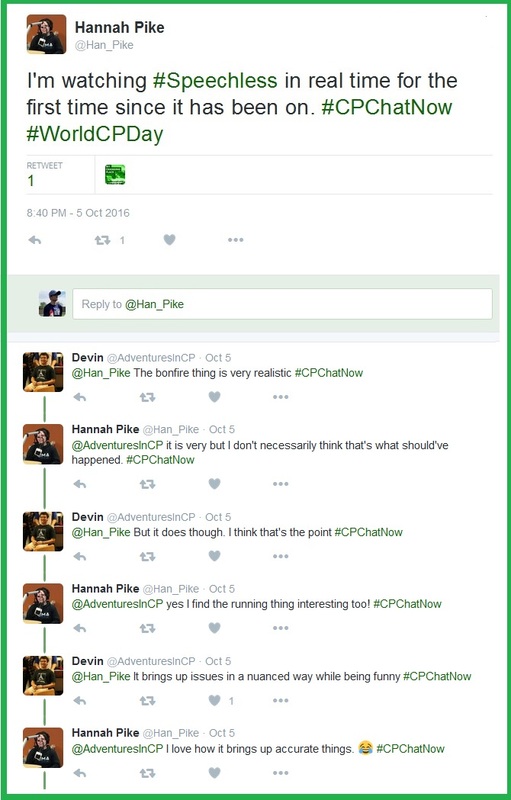 First, came our October focus chat announcement. If you possess questions about CPTV, please join us tonight. 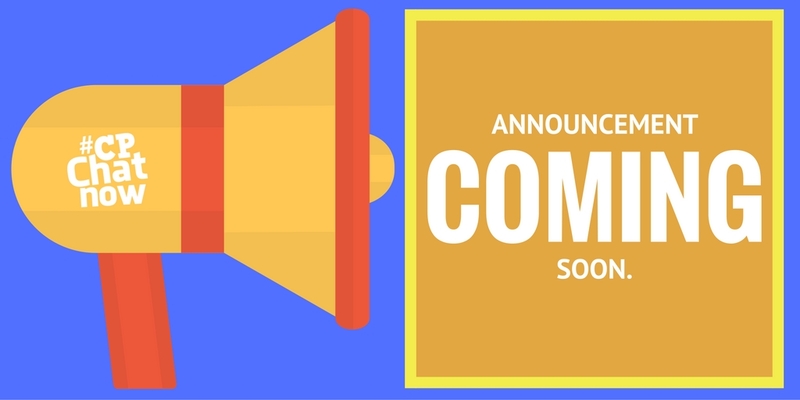 Anyone unfamiliar with CPTV should read our detailed announcement post. 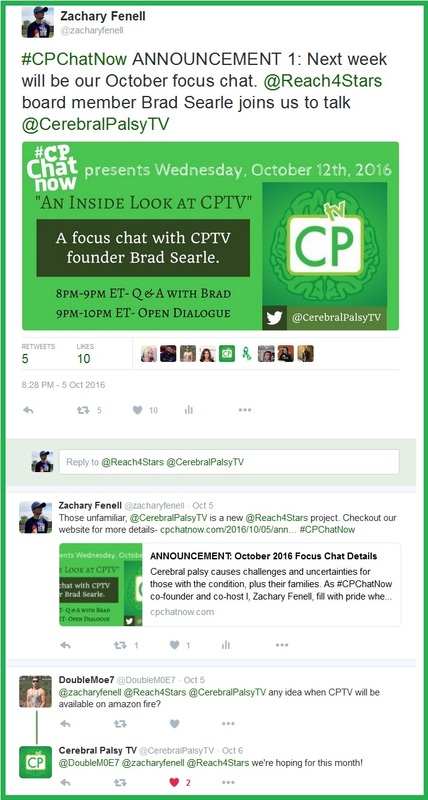 Repeating what I wrote in the announcement, personally I believe CPTV can become a central resource for the cerebral palsy community. While counting down the minutes to tonight, mark your calendars for the October 2016 Google Hangout. Google Hangouts allow for face-to-face interaction via video chat. Contact my co-host Blake Henry or I about receiving an invite to the October Hangout. These video chats work similarly to our Twitter chats. Topics arise naturally. 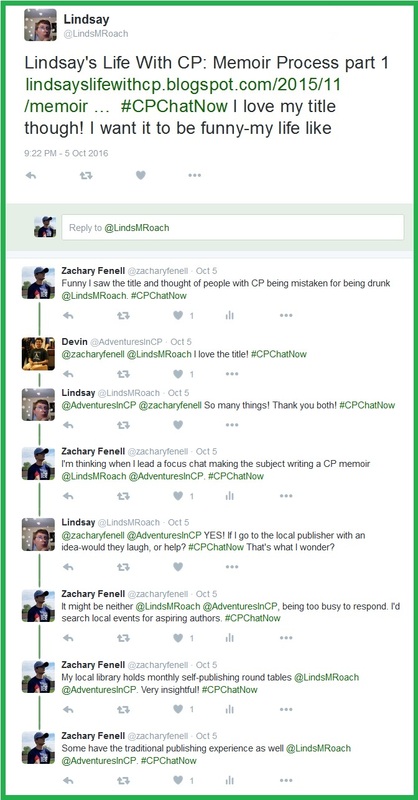 One topic brought up during the Twitter chat October 5th involved writing a memoir. Visit Lindsay’s blog to see what she plans to title her memoir. Then engage in your own creativity and answer the following for the week’s extend-the-conversation question. 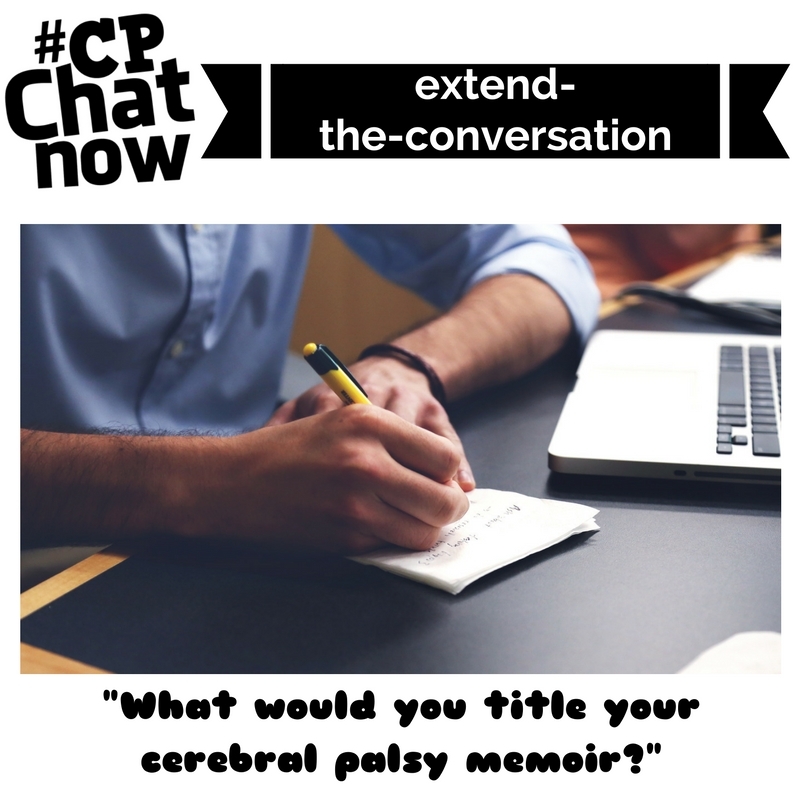 “What would you title your cerebral palsy memoir?” Leave your response in the “Comments” section. Finally, I wish to take a moment to thank everyone who contributes to our community. 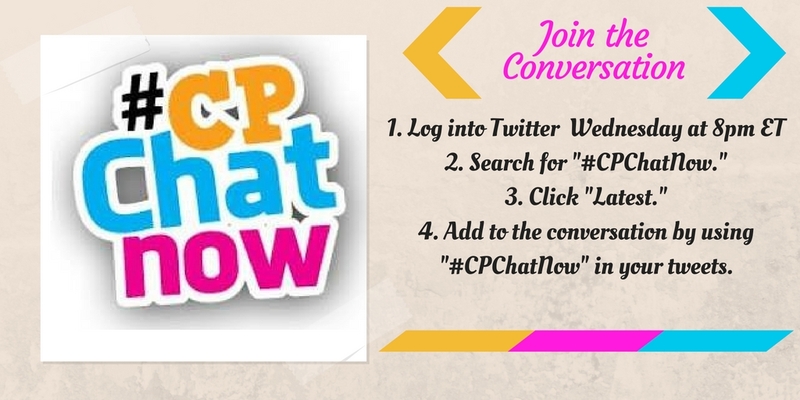 You enable #CPChatNow to thrive. As you can see our community makes a difference. Again, thank you. Keep contributing too! Answer the week’s extend-the-conversation question. This entry was posted in Weekly Recaps and tagged cptv, speechless, World Cerebral Palsy Day. Bookmark the permalink.